Thrash is probably the most difficult metal genre to innovate in, almost by definition, since you are supposed to be direct, aggressive and maybe somewhat simplistic. So, how many ways can there be to slice this pie? Canadians Untimely Demise find an interesting way to answer that they don’t have to innovate with their thrash debut City of Steel that much, yet they manage to sound absolutely relevant. Perhaps they let their passion do the talking and simply throw a ton of riffs at the listener in the short span of 30+ minutes. There is no doubt that these Canucks took a sip or two at the place where they were serving some old school Germanic thrash. Virtue in Death and Unmaker (after it grows vicious from its cleaner beginning) reveal a lot of Sodom, Destruction and Kreator, albeit with some smoothing of the edges. At the same time to only copy those grizzlies would have been a downfall from the start, and Untimely Demise blend quite a bit of tight and dry deathly gallops with their helicopter chops (title track, Virtue in Death). The resulting mixture tends to fluctuate then between stubborn thrash and proto-melodic death of Carcass circa Heartwork, given that Untimely Demise presents a huge multitude of riffs on this album. Some of them grip (Bloodsoaked Mission), some miss (Streets of Vice), but the effort, skill and desire is obvious. In their further yearning to be known as the band which can play guitars, Untimely Demise extends their solos to the point rarely seen in this relatively austere genre. While some may think it is detracting from the overall energy and constant attack, I found it interesting to observe how the abovementioned helicopter chops can evolve into melodically sensible solo (Virtue in Death). With their melodic edge Untimely Demise did remind me somewhat of Blood Tsunami and that band also left a mark with their debut giving in a little to the melodic aspect. 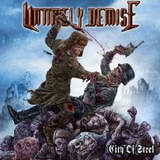 Where Untimely Demise certainly do not give in is their vocals. One or two vocalists, the approach to vocals is certainly dual for the band. The more traditional thrash snarls are bordering on ridiculous evil troll sounds, but, thankfully, that voice is augmented with more manly hollow shouts and deeper bellows. Simplistic enough for the pure trash aficionados and plenty involved in the guitar department for the Amott brothers’ fans, Untimely Demise possess one feature evident throughout City of Steel. They care about their music and what you hear is probably exactly what they intended for you to hear, thus you can take them at their word. To be of interest in the modern thrash is no easy feat to accomplish, but the band does it rather honorably.